The melody of Kool & the Gang’s “Celebrate” could be heard in the Pleasantdale Elementary area of Doraville on the morning of Thursday, October 25. A keen listener, however, would have noticed the lyrics had been changed to mark a momentous occasion. 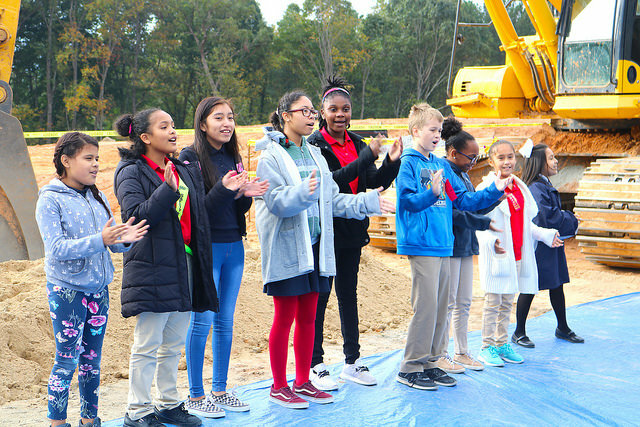 DeKalb County School District (DCSD) broke ground on the new Pleasantdale Elementary School by welcoming teachers, students, staff and community partners to an official celebratory ceremony. The event featured words from district officials as well as a student performance from the Pleasantdale Singing Club. 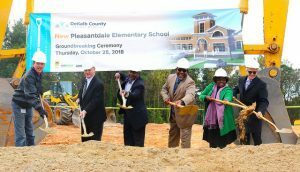 According to Green, the new Pleasantdale Elementary was made possible by DCSD collaborating with DeKalb County government, Evergreen Construction, CGLS Architects, the Pleasantdale Advisory Committee, the E-SPLOST Advisory Committee, and Concorde Soccer. Pleasantdale Elementary’s reconstruction is the product of the DeKalb County education-specific special local option sales tax (E-SPLOST), which was renewed in May 2016 following overwhelming approval from voters. The school was originally built in 1968, with the last major renovation taking place in 1998. Board of Education member Jim McMahan was present on October 25 to share his thoughts on the incoming building. Fifth-grade student Hermione Lizama Sala joined Dr. Green, McMahan and Dr. Harrington in providing inspirational words at the ceremony.